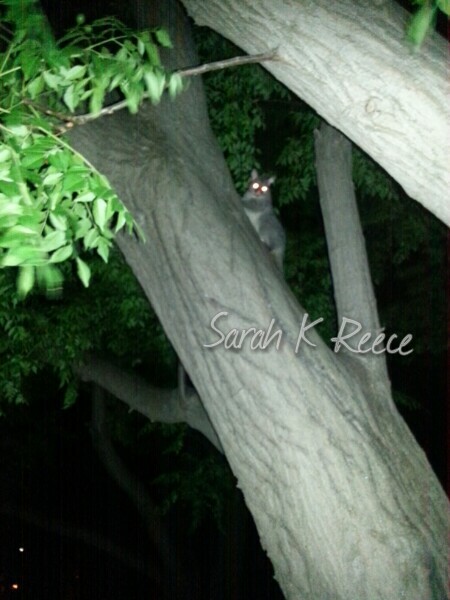 Say hello to laser possum… I’ve been walking the dog every night round the block at least, come rain or heat. Tonight this chap was on our beat. Today was strange. I’m good and fine and also sort of heartsick and world weary. My to do list runs onto several pages, none of which I feel like dealing with. Facebook feels icky instead of connecting. I’ve been cooking from scratch lately and enjoying that – pikelets, pancakes, waffles (savoury and sweet), and gluten and dairy free cake for a birthday today (surprisingly tasty!). It’s satisfying, especially cleaning the trashed kitchen into the dishwasher afterwards. This week begins the big move – Rose’s lease is at an end. Next week work starts again. In between I expect lots of tears and stress. We started a day early on that today. After homelessness, I don’t think either of us are ever going to be able to do house moves without major stress. 😦 Patience and love in large dollops. Strange dreams. Reading a lot. Writing a little when I can, impatient to start on my book again soon. Happy and not happy. Excited and dissatisfied. Moving toward good things, and away from good things. On the right path and yet missing something important. Such is life. One foot, then the other. Sarah, You have expressed your experience and feelings in such a way that my heart can connect to what I hear you share, thank you for your beautiful way to share and care.